I love maps. I suspect most Canadian Geographic readers do, too. And given that cartography is one of our pillars, we’re very proud of the fact that we’re one of a few — if not the only — media outlets in the nation with a full-time map-maker. Working with our amazing cartographer Chris Brackley allows us to create lots of original maps to help illustrate and provide additional context for our stories. For the past few years around this time, I’ve written a blog highlighting what I feel was the best of Brackley’s work in the previous calendar year (see 2016 here and 2015 here). Each year it’s getting increasingly difficult to pick just a handful. Here are five of the best Can Geo maps from 2017 — though regular readers will know there were many, many more. Did you have a favourite map this year? Let us know about it in the comments! I had been dreaming of creating this map. 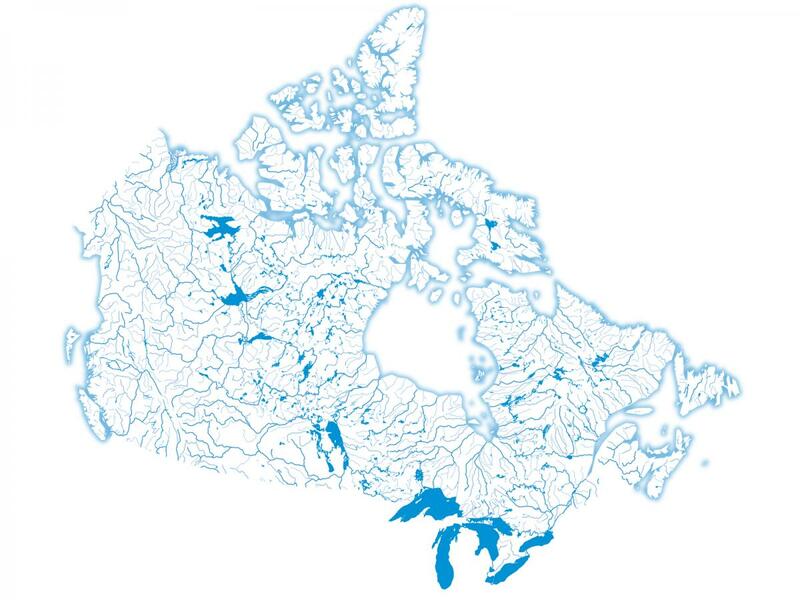 I’d had this vision of showing Canada with only rivers, lakes and coastlines in blue, stripping away all other land cover. I figured the result would be both impactful and artistic. Brackley delivered on that vision in this map that accompanied a short item on fresh water in the special interest publication we created in conjunction with The Walrus magazine to celebrate Canada’s sesquicentennial, The Story of Canada in 150 Objects. The Yellowstone to Yukon Conservation Initiative, an actualized concept that protects and connects critical wildlife habitat in a range of ecosystems from southern Wyoming to northern Yukon, celebrated its 20th anniversary in 2017. In recognition of the milestone, Can Geo interviewed Y2Y’s founder Harvey Locke for our January/February 2017 issue, focusing largely on his latest initiative, the “nature needs half” conservation edict. (In essence, Locke believes half of all land should be protected for conservation purposes). 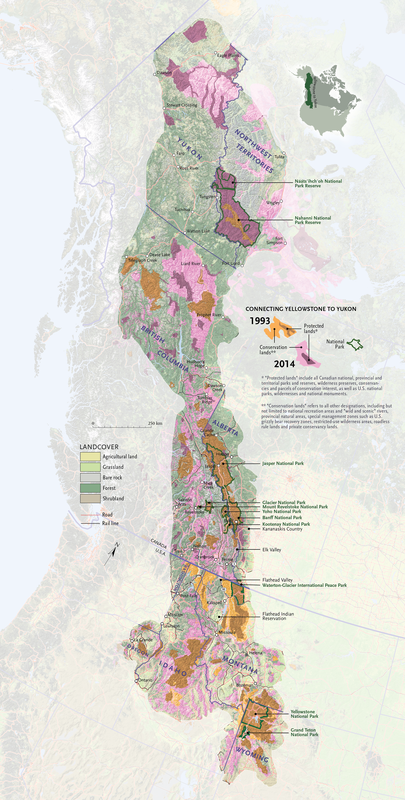 To go with the piece, Brackley created this amazing map of Y2Y that illustrates the vast series of connected areas — from territorial, provincial, state and national parks to other protected lands — that are proving the original initiative to be an overwhelming success. As climate change stands to radically alter the globe’s polar regions, Arctic sovereignty has once again become a hot-button issue. Before his death in October 2016 at age 93, legendary geologist, geophysicist, explorer and diplomat Fred Roots wrote an essay for Can Geo (published in our March/April 2017 issue) on the significance of the North Pole. 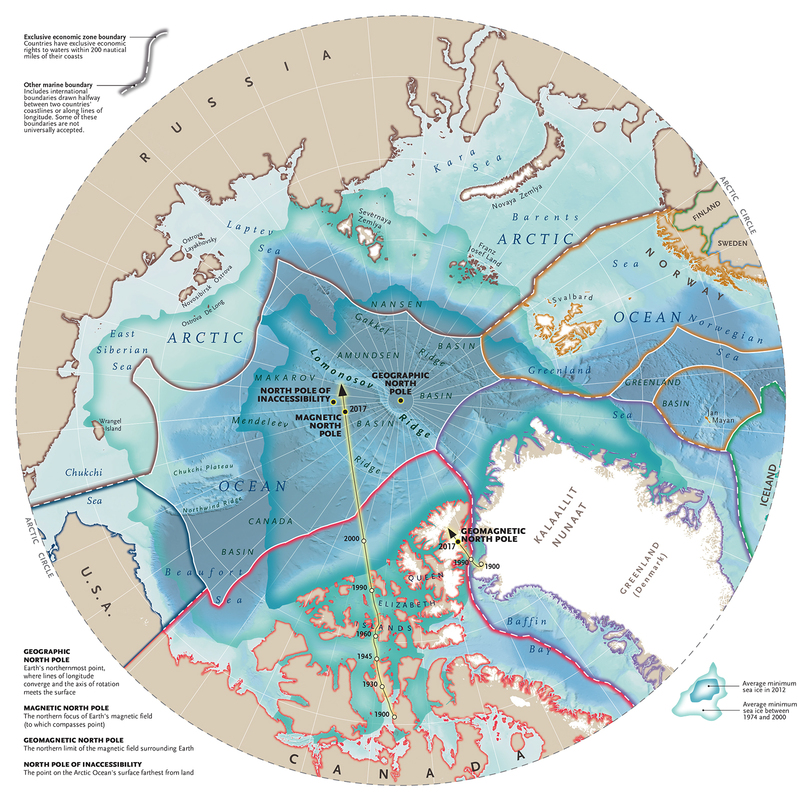 Brackley mapped the region in great detail for the story, showing the exclusive economic zone boundaries of the Arctic nations, the four north poles (geographic, magnetic, geomagnetic and inaccessibility), sea ice change and more, to create a comprehensive picture of this sought-after symbolic point. Over the past three years, Brackley has created a three-part series mapping Canada’s major cities. For the third and final instalment of the series, published in our May/June 2017 issue, Brackley charted the conurbation — an area where a number of once-freestanding cities or towns have grown together into a continuous agglomeration — of Vancouver, Calgary, Winnipeg, Toronto, Montreal and Halifax, at the same scale. 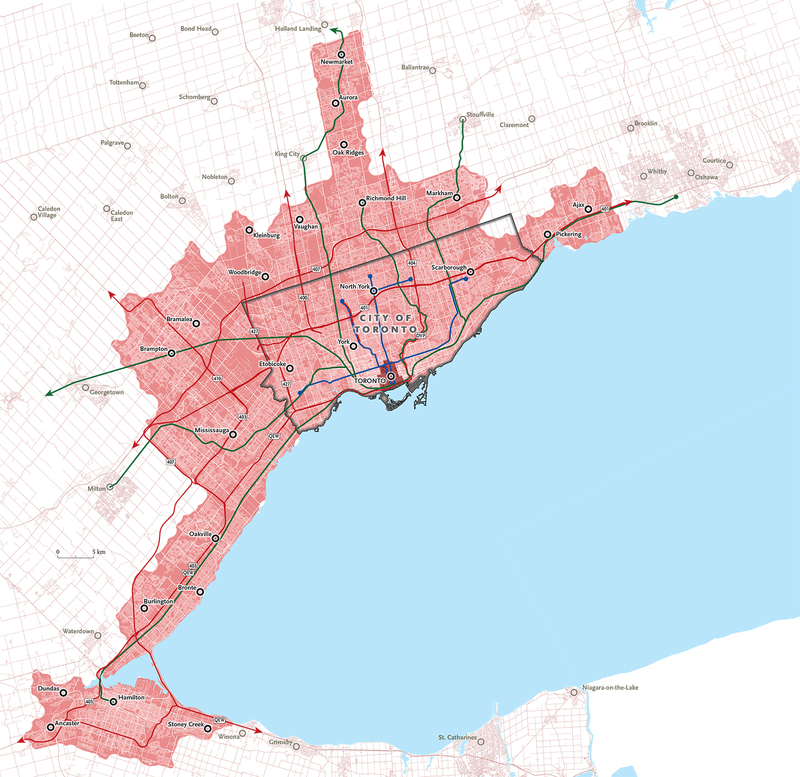 Comparing conurbations is interesting, and each city’s conurbation tells an intriguing story, though perhaps none more so than Toronto's, shown here. At a glance, one can see the super city emerging, engulfing two dozen other cities, with a number of other communities on the verge of being literally connected, too. In conjunction with the forthcoming publication of the Canadian Geographic Indigenous Peoples Atlas of Canada, Can Geo dedicated its November/December issue to Indigenous Peoples. When it came to creating our “On the map” department for the issue, there was little doubt the piece should focus on Indigenous languages in Canada. Just three — Cree, Inuktitut and Ojibwa — of the 60 Indigenous languages in the country are believed to have enough speakers left to be sustained indefinitely. 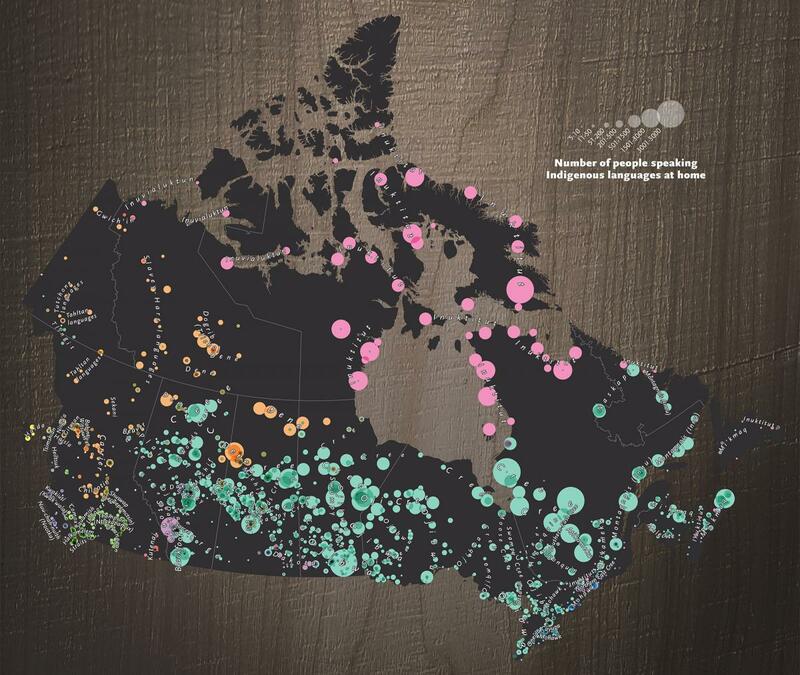 Using the most recent census data from Statistics Canada, Brackley created a beautiful-looking map that depicts a stark reality: that, at most, there are no more than 5,000 speakers of an Indigenous language in any single Canadian community.